With a Psychic Calculator you can create endless mind-reading, prediction, and magic effects - a mentalist dream come true. 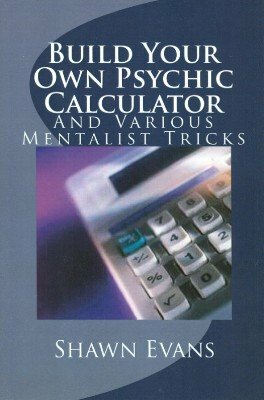 Don't pay up to $300 or more for a Mentalist or Psychic Calculator when you can make your own in less than 30 minutes, for under $10 (including the price of the calculator! ), plus the use of just a few common household items. No knowledge of electronics needed - just the proper know-how. This ebook will give you the "details in detail" with over 20 step-by-step photos and illustrations that will guarantee your success. 1st edition 2012, 56 pages, photo illustrated. A few days ago, I gave this book 5 stars because it is a great book on how to modify calculators. After reading all the supplemental information on mental math effects, I have to give it another 5 stars because there is a real gem on page 46. I have been reading mental math and magic books for the past 50 years and I have never seen anything like it. The 3 By 5 Trick is easy to learn and a real reputation builder. Try it - Play with it - you'll like it. This effect, by itself is worth the price of the book. Thank you Shawn Evans. Great book. Clear instructions with detailed step by step photographs. Calculators are easy to find at Office Max or Amazon. The effects are easy to understand and perform.